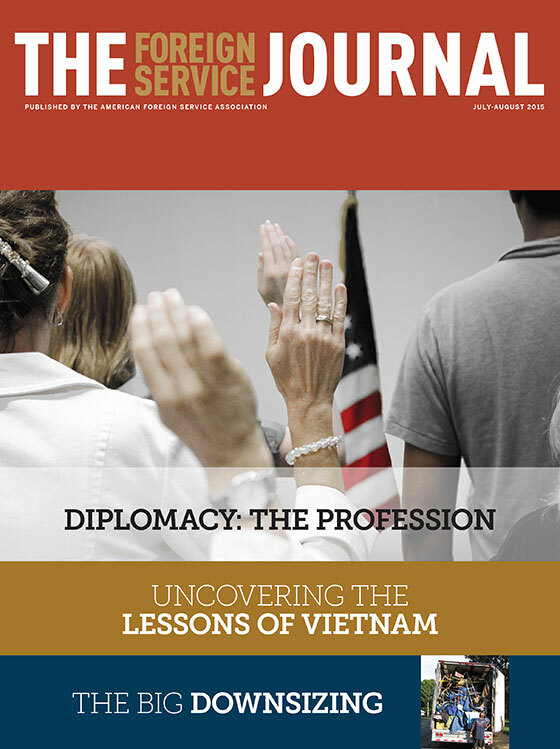 The July-August issue explores the state of diplomacy today. The Foreign Service is being deliberately undermined, a new AAD report warns. The Academy offers 23 recommendations to reverse the threat to American diplomacy. AFSA members discuss the AAD report. In a quest to become the “best diplomatic service in the world,” the U.K. establishes an institution dedicated to equipping its representatives with the necessary skills, knowledge and tradecraft. A participant in developing the 2015 Quadrennial Development and Diplomacy Review summarizes its highlights for skeptics. In 1961, the legendary diplomat talked with his colleagues at AFSA about the profession of diplomacy. “Lessons Learned” from State In 1961, the legendary diplomat talked with his colleagues at AFSA about the profession of diplomacy. The Kissinger Memo In National Security Advisor Henry Kissinger’s view, Vietnam offered very few lessons that could be usefully applied elsewhere. Deconstructing the uproar over a controversial Al-Jazeera interview, the author offers insight into the challenges of public diplomacy. Here are some lessons learned on the retirement transition from a member of the Foreign Service who's been there recently.